The author, a veteran journalist and travel writer, looks back on his long career. A few decades ago, Hunter S. Thompson, Mr. Gonzo himself, told Bone (Maverick Guide to Hawaii, 2009, etc.) he should write a book. And so, eventually, he did. Thompson and Bone met when they worked together at the Middletown Daily Record in the 1950s. The author’s stint at the Record also provided the title of his book. An uptight publisher who was displeased about something Bone did shot off a memo to Bone’s boss. It consisted of two words: “Fire Bone.” The editor sent a memo back: “Bone stays.” The Record was the first of many places the author worked during his long and varied career. He found a spot for himself at the Buffalo Courier-Express, the San Juan Star, the New York Post, Popular Photography Magazine, and the Honolulu Advertiser (to name a few). Having gotten a taste for travel writing while working for Temple Fielding’s string of guidebooks, the author transitioned into his own travel series, published under the rubric, “The Maverick Guide to....” Oddly, Bone’s chapters on his travel adventures are less interesting than his anecdotes about working for the Time-Life Book Division in the early ’60s. The stories have a lively Mad Men vibe—a tribute to the three-martini lunch, the New York blackout of 1965, Chumley’s in Greenwich Village, etc. One of his best tales is about the so-called “thinking desk,” Time-Life’s version of an elephant graveyard. It’s where editors deemed superfluous to the organization are “promoted.” In those paternalistic days, the company couldn’t bring itself to fire these old-timers. Typically, the employee would stay until he couldn’t stand it anymore. His resignation would usually consist of corporate euphemisms such as he would like “to spend more time with his family” or “to return to his first love, freelance writing.” Bone has a fine memory; he even remembers the names of his high school barbershop quartet members. And he can make a good story out of almost anything, including his final days at the Honolulu Advertiser. (He resigned after 13 years.) The book could probably use less about his pre-journalism days and more of his escapades in Manhattan. Still, he’s an entertaining writer who, as they say, has seen it all. And written about a lot of it. 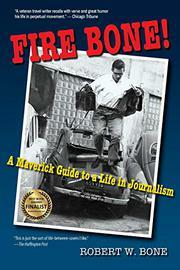 Though it could probably be a good 100 pages shorter, Bone’s memoir is served with verve and good humor.